Tuesday: Vegetable curry, brown rice & a salad. Thursday: We'll go out for dinner. Friday: It's "Salad Friday," and we'll have my "French Salad" with poached eggs. Questions: What's your favorite fruit at the moment? What meals do you have planned for this week? Please share! I actually DON'T have a plan and that is very frustrating for me. we DO however have tons of leftover food from weekend bbq's so that's helping get me by for now. Probably hit the store tonight. I seem to be scarfing watermelon down by the pound as well, it's just so juicy and good. I'll probably finally be sick of it by the time it stops showing up in the produce section. Love how that works out. Oh, right now, freshy cherries...but I would DIE for a fresh fig with honey! ohh I can't wait to see the veggie curry! all of the meals sound great! 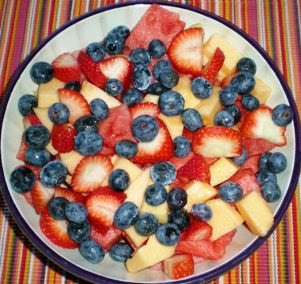 Hmmm, my favorite fruit at the moment is probably frozen blackberries! Wierd, but they have tasted so good to me lately. As far as meals for the week, I'm planning some turkey burgers, and egg beater omelets (boring) but I spice them up differently each time! mmmmmm veg curry...one of my faves! Just had some Indiana muskmelon this week that was fabulous!